Bending the Landscape: Fantasy is a fantastic anthology of gay and lesbian themed fantasy short stories edited by Nicola Griffith and Stephen Pagel. Part of a series of three, the Bending the Landscape anthologies are very worth checking out. 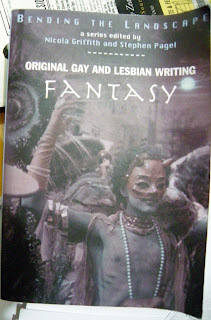 This is an overview of the lesbian stories in the fantasy anthology. The Fantasy anthology contains twenty two stories by gay and lesbian writers, or by straight authors about gay and lesbian characters. Some of the authors are 'big names' (e.g. Ellen Kushner, Mark Shepherd and Tanya Huff), while others only have a few short stories published. There's a nice section of biographies at the back, so you can read more about any authors that catch your eye (bear in mind that it's nearly fifteen years out of date now). Sometimes the 'gay' aspect is very subtle, other times it is the main focus of the story. There's an overview of the Bending the Landscape series among the very first reviews on this site, if you're interested in the other two books (the science fiction volume is absolutely brilliant). The short stories themselves are generally very good, quite aside from any issues of sexuality. Unusually, in GBLT anthologies, this one is not dominated by gay men, instead being exactly half and half. However, the lesbian stories are frequently much more understated, so I barely noticed them the first time I read the book (now I know what to look for, they're pretty obvious, but the gay men's ones tended to be much more open and in your face about the sexuality of the characters). Fantasy wise.... a lot of these stories could have fitted just as well into the science fiction anthology, or the Horror one - quite a few ghost stories here, as well as a vampire, a pyschic and what could easily be aliens. I get the impression that the editors received a lot of great scifi, and not much fantasy, so had to put some of the scifi stories into the fantasy anthology. Many are set in the contemporary world, but there are a few 'traditional' fantasy kingdoms as well. Rigid, angry Galena is an art critic and she fell in love with a heedless, gentle artist. When Thea leaves her for a mysterious colony of artists, she goes after her - but cannot accept the mysterious inspiration offered by the beings behind it. A girl and her cousin spy on a pair of old ladies - and get a magical show of lesbian love, instead, leading to new possibilities and opened minds. This was quite a weird one, like a distorted glimpse into a coming of age story. The cloudmaker sees a human girl and sweeps her up into the sky, discovering the joy of love and company for the first time. But immortal beings are careless and humans bore easily. Her lover Ellen is dying on cancer. During her last hour, Carrie goes back to her beloved's hometown, connected to Ellen on the other end of a neural link that lets them feel each other's physical sensations and communicate mentally. There, she sees the orca that Ellen had an incredible connection to and says goodbye to her beloved. A foolish and corrupt king faces a terrible army out of legend in vengeance for the envoys he murdered. His immortal advisor helps him avert war, by returning the lost love of the angry queen, at great personal pain. Set in Korea, a browbeaten young girl lives in misery under the rule of her husband and mother in law, finding joy and escape through the ghost of the First Wife. A professor loses his lover to a woman, stirring up his spirit wolf and causing heartache all around. A depressed and withdrawn woman visits a lighthouse and falls in love with a ghost. She watches the ghost and her lover, and eventually finds joy and accepts herself again. In 11th century Japan. a noble's daughter becomes fascinated by a girl fascinated by insects, at the expense of her reputation. But a butterfly reminds her that butterflies only live for a day, and love is for ever. Terizan is a thief who steals from a god and regrets it, and is forced to track down the icon she took, and return it. Terizan is one of the few lesbians that Tanya Huff has actually written about, and is well worth checking out. You can read all the Terizan short stories in Finding Magic and Stealing Magic. While the science fiction anthology was better, that's because it was amazing - it also had less lesbian content. Bending the Landscape: Fantasy is one of those books every gay or lesbian fantasy fan should pick up, and non-gay fantasy readers should check out, as well. World Fantasy Award, Best Anthology. You can buy Bending the Landscape: Fantasy on Amazon, but it isn't available for the Kindle. It was originally published in 1997, reprinted in 2004.